Welcome to Mills Middle School, Home of the Comets! We would like to take this opportunity to partner with parents and the community to ensure that ALL students receive positive social and academic learning experiences throughout the year. It is our desire as the instructional team to promote respect for one’s self, one another and adults, while exposing students to effective researched-based instructional strategies. Our Mission is to provide an academic environment that provides ALL students with the opportunity to excel academically as well as socially. Our extracurricular activities will provide your child with an opportunity to showcase his or her talent outside of the classroom. As the instructional leader of Mills Middle School, I am committed to guiding and leading our staff in partnering with you and the community to ensure that academic success is top PRIORTY. Our school theme is New Beginnings with an End in Mind. I know with us partnering together we can strive to make our school excellent in every way. We will collaborate with all stakeholders to build a strong foundation for your child to succeed academically and socially. The Mills Middle School instructional team and I will work rigorously to provide a safe and high quality learning environment. Research has stated when a parent is actively involved in a child’s education, they will be successful academically. I challenge you to hold us accountable for providing the best educational setting for your child to excel. Once again, I look forward to partnering with you to strive for an awarding school year. 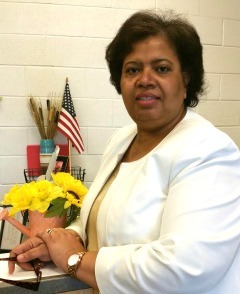 Mrs. E. Lisa Watson, Ed.S.